Solapur, which is located at the border of Maharashtra and Karnataka, is well connected to all major cities of within the state and other neighboring states like Hyderabad, Aurangabad, Pune, Mumbai, Nashik, Kolhapur etc. You can see regular bus services in all these routes, which are operated by the state government and other private transport services. Solapur has quality roads that lead to all main cities in Maharashtra and outside of the state from Solapur. As Solapur is located on Pune – Hyderabad NH9, road transportation is widely chosen by people to reach to the city. People mainly depend on roadways to travel from Solapur to other nearby cities like Tuljapur (45 km), Paranda (95 km), Pandharpur (73), Pune (274 km) and Mumbai (402 km). Solapur city is also linked with other main cities in Maharashtra like Nagpur and Aurangabad as well as other cities in nearby state like Hyderabad, Bangalore and Chennai etc by roadways. Ratnagiri – Nagpur Highway NH – 204: Solapur – other cities in Maharashtra like Nagpur, Kolhapur, Sangli and Nanded. You can travel to Solapur in buses owned by M.S.R.T.C (Maharashtra State Road Transport Corporation). People usually depend on these state transport services to travel between Solapur and nearby cities like Pandharpur, Karmala, Barshi, Akalkot etc. It also conducts long route services to other cities of the state like Pune, Mumbai, Ahmednagar, Aurangabad etc. Besides, there are many private bus service providers like Bhumi Travels, Alka Tours and Travels, Neera Tours and Travels, Omkar Tours and Travels, K K Tourist Services and Om Travels etc functioning in the city that operate buses between Solapur and other famous cities. Most of these companies also offer online booking facility to the people that will be really helpful for tourists and pilgrims. You can also hire taxi to travel on these roadways that are fastest transportation option, even though expensive than bus services. Maharashtra State Road Transport Corporation (M.S.R.T.C ) operates bus services to all important towns and cities of the districts from Solapur. You can see the bus time table is displayed at the bus stands that will help travelers who are not much familiar with the city. There are regular bus services at frequent intervals to all cities such as Ahmednagar, Karmala, Kurduwadi, Shirdi, Nasik, Alibagh, Bhivandi, Chinchwad, Mumbai, Thane, Pune, Akkalkot, Gulbarga, Ganagapur, Narayan Peth, Bidar, Tandoor, Umerga, Humanabad, Akluj, Chiplun, Kolhapur, Karad, Medha, Phaltan, Pandharpur, Roha, Satara, Sangali, Mangalvedha, Jath, Barshi, Wai, Tasgaon etc. There are buses to Bijapur in Karnataka, Tulajapur, Pandharpur and Pune at any time round the clock. Visit the page http://solapur.gov.in/htmldocs/msrtc.pdf to know the ST bus services to different nearby cities and their time details. Besides the M.S.R.T.C bus services, there are many private bus services operating in Solapur like Neeta Tours & Travels, S P M Holidays, Tourister Hub, Xpress Travels And Services, Apna Travel Services, New Sumit Travels, Tour India, Metro Link Travels, Beena Tours and Travels etc that runs several buses from most of the important cities of the state and other states to Solapur. Road distance between Solapur and Pune is 264 km. The major direct buses between these two cities and are operated by Syndicate Travels Corporation, Akbar Travels, Neeta tours and Travels, VRL, Sankalp & Kareema Travels. The lowest bus face from Pune to Solapur is Rs 400 for VRL and the highest rate is Rs 1500 for Neeta Tours and Travels. Nashik is 381 km away from Solapur to Nashik by road. As there is no direct private bus service to Solapur from Nashik. But you get buses from Shirdi and Nashik and from there to Solapur. 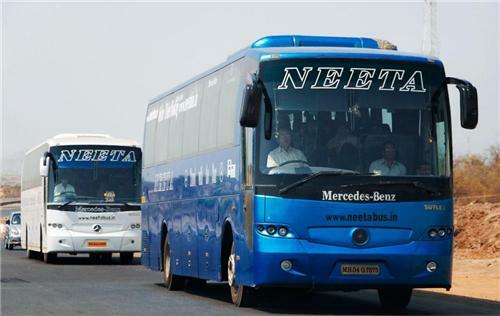 Neeta Tours and Travels operates bus services from Nashik to Shirdi and Prateek Travels runs buses from Shirdi to Solapur. Solapur is at a road distance of 312 km away from Aurangabad Humsafar Travels is the major bus service between these two cities. The average bus fare from Surangabad to Solapur is Rs 500. There is no direct bus service from Solapur to Ahmednagar, which is located at a distance of 249 km from Solapur city. But, people get bus services from Ahmednagar to Pune and from there to Solapur. The major bus services in these routes are Paulo and Sur Intercity. The road distance between Mumbai and Solapur are 396 km. The direct private bus services between these two cities are VRL, Sankalp & Kareema Travels, Raja Travels, Akbar Travels, Omer Travels and Neeta Tours and Travels. You can travel from Solapur to Mumabi at the lowest rate of Rs 350 and at the highest rate of Rs 1500. State Transport bus services are available to travel from Solapur to Goa, which is about 437 km away from Solapur city at an average fare of 700.